Congo African Greys can be found in Uganda, Kenya, Liberia, and islands off the west coast of Africa. 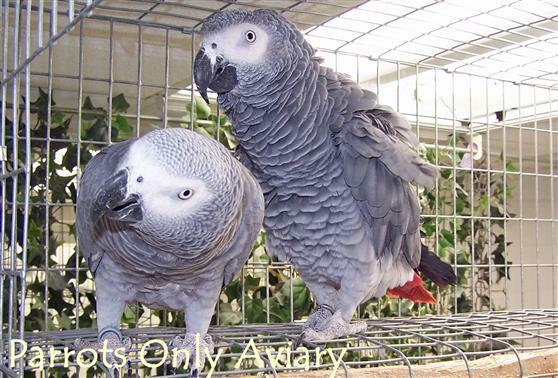 The Congo African Grey Parrot is medium grey in colour with shades of light grey on the body and a bright red tail. Congo African Greys are very intelligent and can be quick to pick up words and sounds. The Congo African Grey's intellectual capacity is that of a 5 year old child but is tempered with the emotions of a 2 year old. They require a stimulating environment. Congo African Greys are playful and very animated with their toys. Provide lots of toys and rotate new toys on a regular basis. They love to chew everything! They are cautious and not outgoing to strangers but are dedicated and loyal to their human companions. 50 years or more depending on nutrition and care. The information provided here is a quick profile of the species and by no means complete.